Introducing the Storm RDX. An adrenaline-fueled machine built for the hunter who refuses to be fenced in by convention. Powered by Horton's radical RDX Technology, the Storm measures an incredible 10" axle-to-axle when cocked, and delivers its 400-grain carbon arrow at a blazing 370 FPS with 122 foot pounds of kinetic energy. 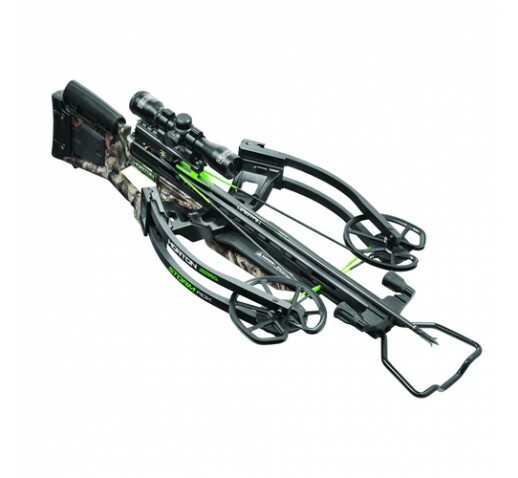 Featured on the Storm RDX, Horton's RDX bow assembly sets an unprecedented standard in crossbow maneuverability with its remarkably narrow profile. A machined, lightweight aluminum riser is outfitted with a self-locking limb pocket and cap system that prevents limb twist and provides added cushioning that reduces limb stress. The pockets are then fitted with 13-inch tactical black 165-pound limbs, powered by a custom RDX Cam System and DynaFLIGHT 97 string and cables. The machined aluminum RDX cams feature 440 stainless steel bearings to increase performance and improve stability. - Length with Stirrup: 35.25"
- Width Axle-to-Axle: 15.50" UnCocked and Cocked: 10"